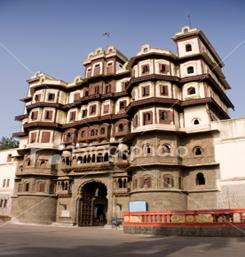 Indore is one of the biggest city in the state of Madhya Pradesh and is popularly called as"Mini Mumbai". The name Indore of the city was derived from a temple named Indreshwar temple. When the state of Madhya Pradesh was ruled by the Holkars they had Indore as its capital. The place has long been a home of cricketers producing international legends like the celebrated C.K.Naidu. Indore in the state of Madhya Pradesh is located towards its west in the Narmada River valley. Initially around 1715 Indore was a major trade centre in the area of Madhya Pradesh. After Indore being the capital city of Holkars it became the headquarters of the British Central India Agency. The city of Indore was planned and built by Rani Ahilyabai Holker. Ganesh Chaturthi - This festival though celebrated throughout the country here in Indore it is quite different. The festival is featured by the carnival of floats. Makar Sankranti - This is also known as the Kite Festival, during which people fly kites and enjoy the day. This festival generally falls in the mid month of January. Anant Chaudas - This festival is highlighted by huge processions of Lord Ganesha in the month of September. It is celebrated with full enthusiasm. Rangapanchami - This is a festival which is celebrated from the period of rule of Holkar dynasty. It is celebrated five days after Holi, during which colors are mixed with water and then poured on others. Ahilya Utsav - Ahilya Utsav is an annual festival celebrated in Indore. It is celebrated to commemorate the death anniversary of Rani Ahilya Bai, the brave queen of Indore. Navratri - During Navratri the people of Indore visit the Bijasen Mata temple where major fair is organized in the months of September/October. Just a few kms away form Indore in an Om shaped symbol island lies this temple and the main feature of it is known as the one of the 12 jyotirlingams of India. 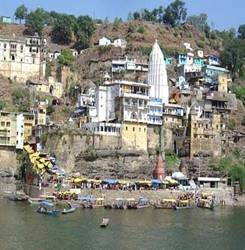 Mahakaleshwar temple- This is the temple of Har Siddhi Mata and the Gopal Mandir which is located at a distance of about 90kms from Indore in a place Maheshwar. This temple is named after its builder which is also referred as Seth Hukumchand temple. It is one of the famous tourist sites in Indore.This Jain temple is intricately adorned by glasses that reflect 21 images of Lord Mahavir, which correspond to the 21 Jain Tirthankaras. 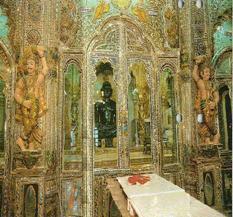 The splendid glass work inside the temple is a fascinating example of master craftsmanship. This temple is famous for its special feature of having the largest statue of Ganapati in the world. The statue measures 8 meters and is made up of iron, copper, brass, gold and silver. This is one of the oldest monument of Indore nearly 200 years old known for its galleries and other man made artifical waterfall. 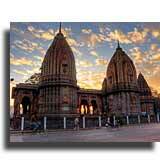 The special feature of this temple is the architecture which is a blend of French, Mughal and Maratha. It belongs to the Holkers dynasty. 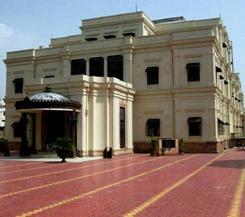 Lalbagh Palace also belongs to the Holkers period which is featured by beautiful interiors and gardens. Various major ceremonies and meetings are held here in this palace. It has one of the best rose gardens of the country. The Palace has been converted in to a museum which functions between 10 am to 5 pm and it lies in the south west of the city. Chattri Bagh houses the memorials of many prominent rulers of this area as domes. This bagh is located near the Khan river. 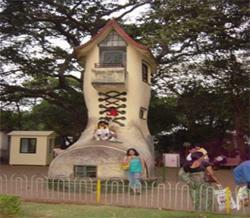 This complex houses the memorial of Malhar Rao Holker. This place houses the monolithic rock temple built in 7th century and redone in 18th century by Ahilya Bai Holkar.It is popularly referred as Garuda Tirth for it is featured by a water outlet in the shape of of Gomukhfrom which water flows out almost as in Abhishek.Deoguradia is located on Nemawar road at a distance of 8kms from Indore. This hillock which is very close to the airport is known for the magnificent view of the sunset from this place. This place is fully decorated during navrathri and many melas and fairs are held.Bijasen Tekri is also coupled with an Arms Museum and a small garden. This museum exhibits many artifacts from the prehistoric to modern era. The most interesting among these are the Paramara sculptures from the 11th and 12th centuries found at Hinglajgarh. The museum has an impressive collection of coins, arms, armors and paintings. This is a beautiful water fall located on the way to Khandwa.It attracts many of the tourists coming here with its scenic beauty. It is pleasure to have a dip in this waterfall. This is one of the prettiest buildings in Indore. 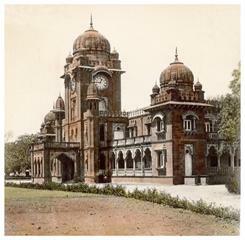 Built in 1904 and originally named as King Edward Hall, was renamed as Mahatma Gandhi Hall in 1948. This Indo-gothic structure is made in seoni stone and its domes and steeples are a landmark of Indore city. It has a clock tower in front, due to which it is also known locally as 'Ghanta Ghar'. The central hall has a capacity for 2000 people and is frequently the venue of book / painting exhibitions, sales, and fairs throughout the year. This place is popularly known as Chidiya Ghar.This place houses a huge park facing the river Khan coupled with a small eat out area. The features of this park include elephant rides, camel rides, pony rides, goat cart and buggy rides. It is adorned with many statues of Gods of various religions. Open to all, irrespective of caste, creed, religion etc., with provision for devotes to pray separately. Central hall is decorated with wall paintings from Puranas, Ramayana, and Mahabharata and is used for religious discourses - Pravachans. Sukh Niwas Palace is a historical building made by Holkar rulers with a mixture of Indian and Western styles in its architecture which is now converted into a Picnic Resort. The city of Indore has several shopping complexes, among which some of the famous places are as follows, Kothari Market- Kothari Market houses all the notable showrooms of important companies of Bombay Dying, Raymonds, Louis Phillipe and many others. MT Cloth Market- MT Cloth Market is famous for exclusive dress materials,Chanderi and Maheswari saris. Sitlamata Bazaar- Sitlamata Bazaar is an important retail market of Indore that specializes in selling saris and other clothings. Heritage Market- Heritage Market is flooded with various handloom and handicraft items. Palasia Market- Palasia Market houses numerous shops of famous companies like Nike, Grasim, Woodlands, Allen Solly, Arrow, Van Husain and Lee. M.T.H Compound- Electronic goods items are got here at reasonable costs. Indore is very well connected to different parts of Madhya Pradesh as well as India. There are a number of National and State Highways passing from Indore and is connected to all the major and minor cities nearby by proper roads.Some of the major cities linked to Indore by road are Bhopal, Barwani, Khandwa, Ujjain, Dewas, Dhar, Ratlam, Khargoan, Jhabua and Agar. Indore is well connected to Delhi and Mumbai by rail. There is a daily Malwa Express to Delhi from Indore (807 km) connecting Ujjain, Bhopal, Jhansi, Gwalior and Agra.Indore is one of the few places in India where both meter gauge and broad gauge railways tracks operate. There are direct trains to Mumbai, Delhi, Kolkata (Howrah) and Chennai.Indore has train services to other major towns like Trivandrum, Ahmedabad, Pune, Jammu, Jaipur, Lucknow, Bhopal, Nagpur, Patna etc. Devi Ahilyabai Holkar Airport in Indore provides services to Mumbai, Delhi, Ahmedabad, Hyderabad, Kolkata, Jaipur, Raipur, Nagpur and Bhopal, via major airlines. There are various airlines operating from Indore like Indian Airlines, Jet Airways, Air Sahara, Kingfisher Airlines and Deccan Aviation.